You've been there: you cover the cost of a pizza delivery or movie tickets for friends, then spend the next week trying to get each one to pay you back. Facebook Messenger is today introducing an easy way to send and request money from the whole gang at once: group payments. Now, you can ask everyone in a chat for their portion without having to chase each person down (there's always that one friend who really lags, too, right?). Requesting money is relatively straightforward. In the group chat, head to the plus sign located in the bottom left-hand corner. You'll see a new payments icon, fittingly a '$' sign. Tap this, then select the people you'd like to request funds from. You can choose to hit up everyone in the group, or just a few individuals. Lucky them. You'll then input the amount you'd like each person to chip in, or the total amount so folks can divvy it up among themselves. Name the reason you're asking your friends for virtual cash, and finally, tap Request. Once the request is sent, a message will pop up in the group chat that lets you see who's paid and who's *cough* holding out. At any point you can look at the request in a full-screen view to see all the details. Of course, you can now also send money to someone in a group chat, so the next time you think you scored a free meal thanks to a charitable chum, watch out. A Facebook Messenger request may be coming your way. 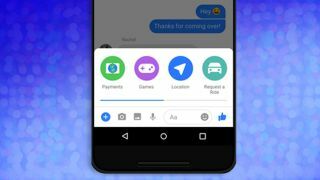 Facebook Messenger has since 2015 let individuals send payments to one another, so adding group support is the logical evolution of an already convenient feature. Like Venmo, sending payments in Facebook Messenger is free, however Venmo only offers group payments in beta at the moment. This gives Messenger an assured leg up, as well as one more reason you never have to leave the app. And for Facebook, that's priceless. Group payments are rolling out now to US users.